Materials: Iron, steel, silver, copper, brass, leather, wood. Provenance: Sold by Robert Hales in the 90's. 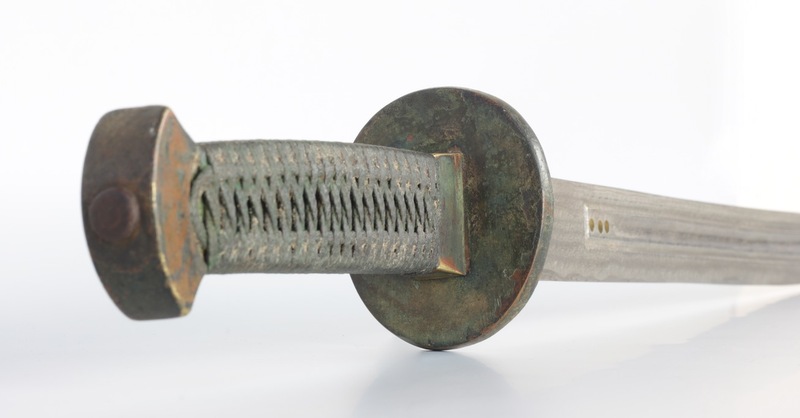 An unusually large presentation saber in the style of high-end Chinese military sabers of the 17th and 18th centuries with a wide center groove and false and blind backedge. The center groove is circumvented at the forte by a Mughal style U-turn fuller, a popular feature in the 17th to early 18th centuries. 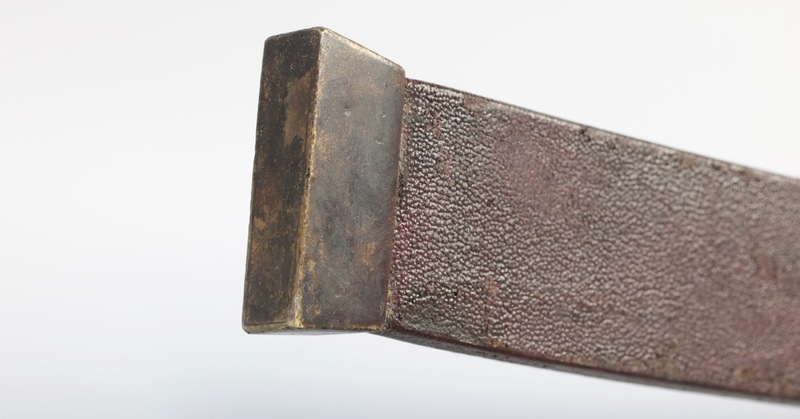 It also has an integrated collar piece, or tunkou , chiseled into the forte. 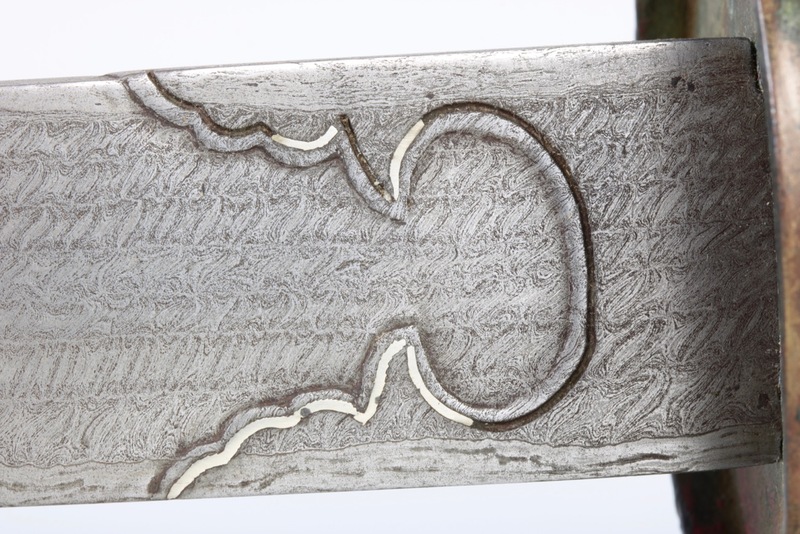 Its blade construction is among the most complex I’ve so far encountered on a Chinese sword: The sides of the blade consist of seven-row twistcore, around a forge folded center plate exposed at back and edge. The execution of the twistcore is both fine and very precise, showing excellent control by the smith. Before the time of heat controlled ovens it was very difficult to forge-weld long rows of twistcore together. 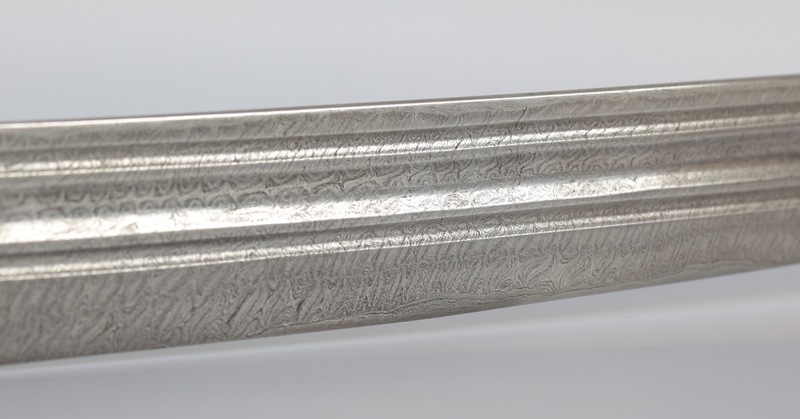 This is why most Chinese twistcore sabers tend to be on the short side, and are often made with up to four rows of twistcore. 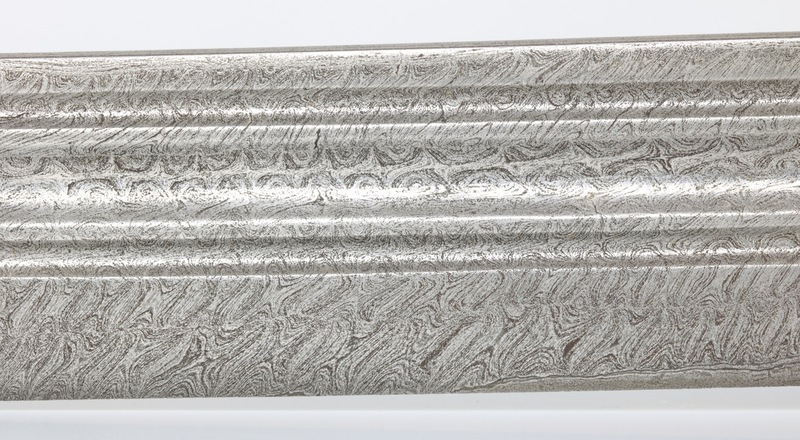 Some longer blades show evidence that it was hammered out to length after the twist-core plates were added, producing a somewhat elongated pattern. 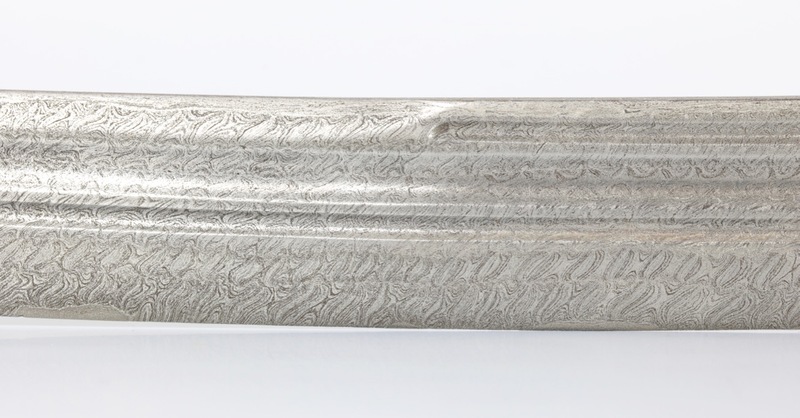 This unusually long blade has a very fine and tight twistcore pattern, indicating that the parts were joined together at this current size. 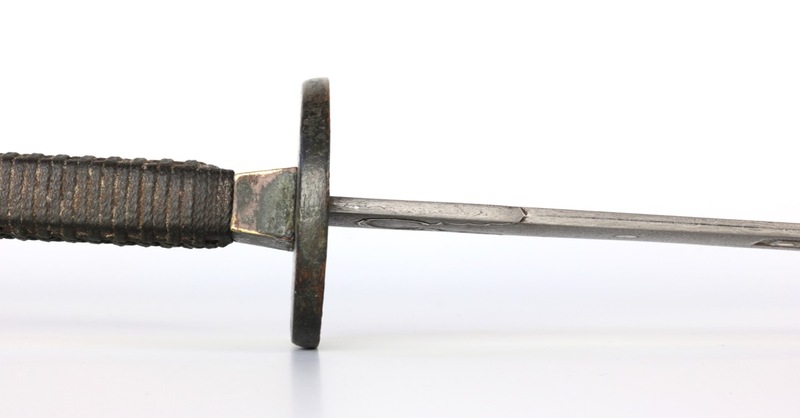 The saber comes in a full set of bronze fittings of typical 18th century angular style, or fangshi . In contrast to the blade, the fittings are remarkably simple yet all are well-executed. 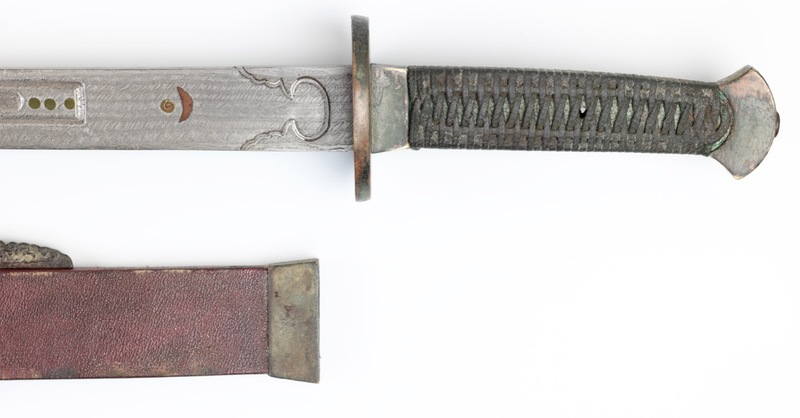 There may have been a religious significance to the marriage of simple fittings to such a blade, or perhaps it was a way to draw most attention to the blade, not the fittings. 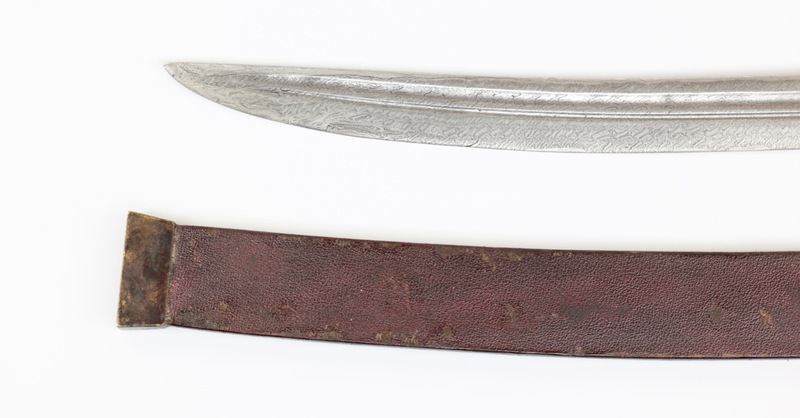 The blade has some interesting features that were probably added by Tibetans in a later stage. 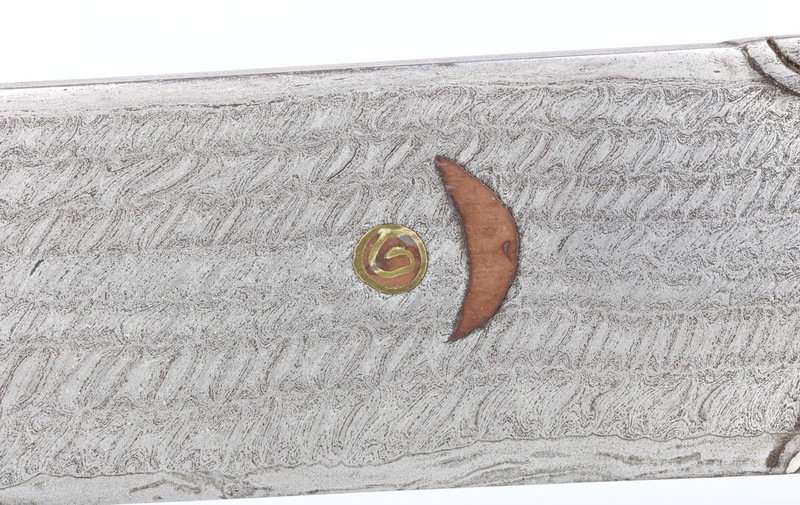 This includes the silver line following the contour of the collar piece, a copper crescent moon and bimetal dot, three brass dots, and a Tibetan text inlay in brass. The text reads: ཁུ་པོ་ནན་ལིང་ or Khu Po Nan Ling. This doesn’t make much sense in Tibetan, and is probably an attempt to write a foreign word or name in Tibetan. The copper crescent moon and dot derive of ancient Hellenistic motifs that originated around the 1st century BC and became widely adopted in Buddhist and Islamic cultures from the medieval period onwards. The bimetal dot, which paired with the crescent moon usually represents the Morning Star, has a spiraling brass center. This may give it a double meaning as representing the urna , an auspicious mark symbolizing a third eye that is often seen on the forehead of the Buddha. The other three brass dots probably symbolize the three jewels of Buddhism, the Buddha, the Darma (his teachings) and the Sangha (his disciples). 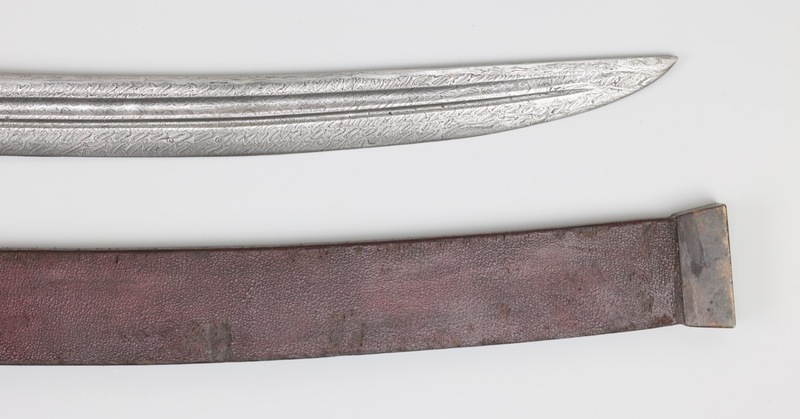 Here we have a large Qing saber with an exceptionally complex blade that was later modified with symbols relating to Tibetan Buddhism and an unknown word in a non-Tibetan language. What does it all mean? 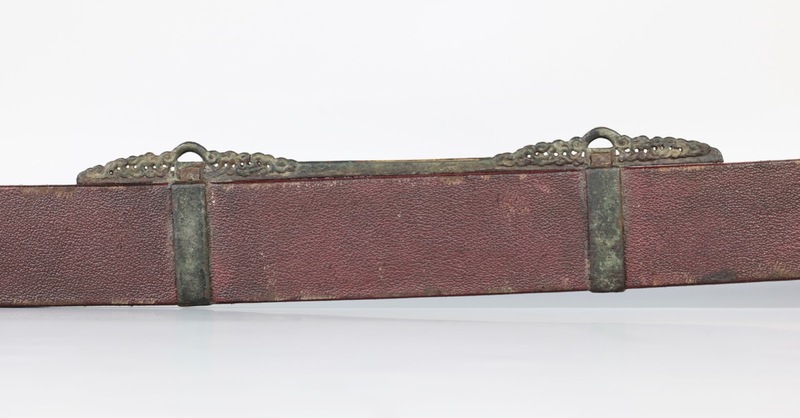 Tibetan monasteries held large armories of votive weapons and armor. 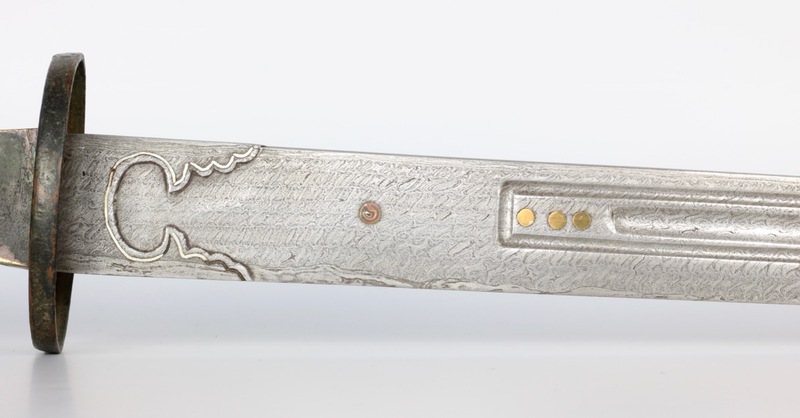 Some of these weapons were used at annual festivals up to the first half of the 20th century, with men dressed in antique armors that were as old as the 15th century. Many of the Manchu ruling elite of the Qing were Tibetan Buddhist, as were many Mongols. There were strong political and religious ties between Tibetan buddhist leaders and the Qing empire. 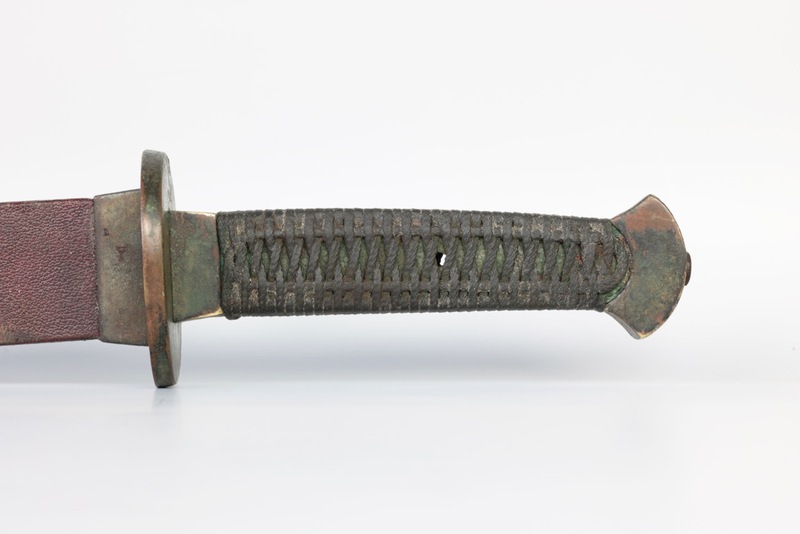 There is a possibility that this saber was made to be presented to the armory of a Tibetan Buddhist monastery. 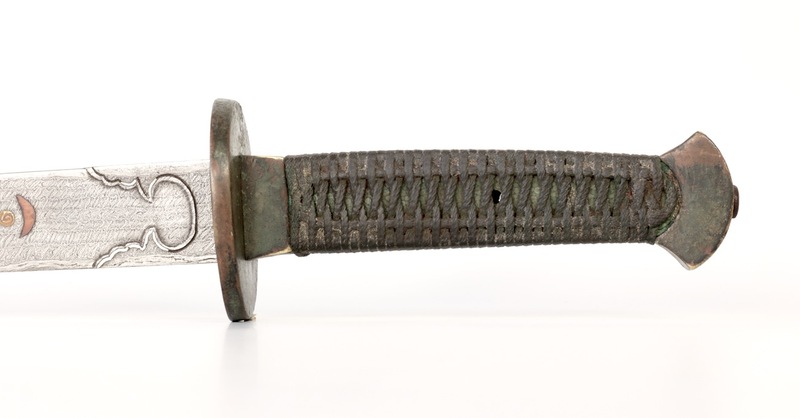 The name on the blade may commemorate a place or name relating to this gift exchange. The scabbard wood is replaced. 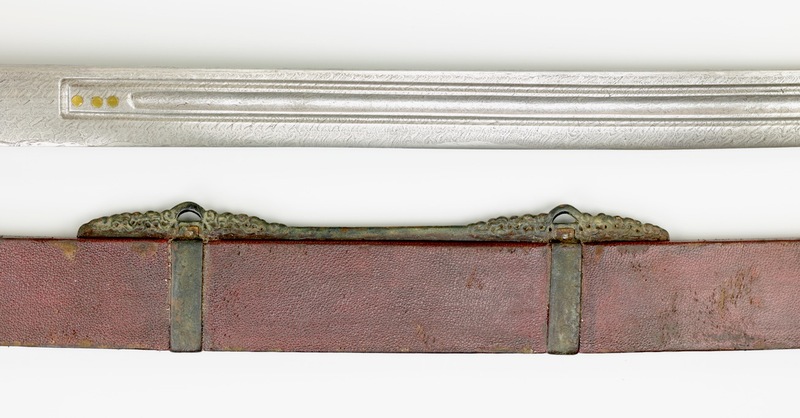 Scabbard endpiece was lost, so was remade and aged to match the rest of the fittings. 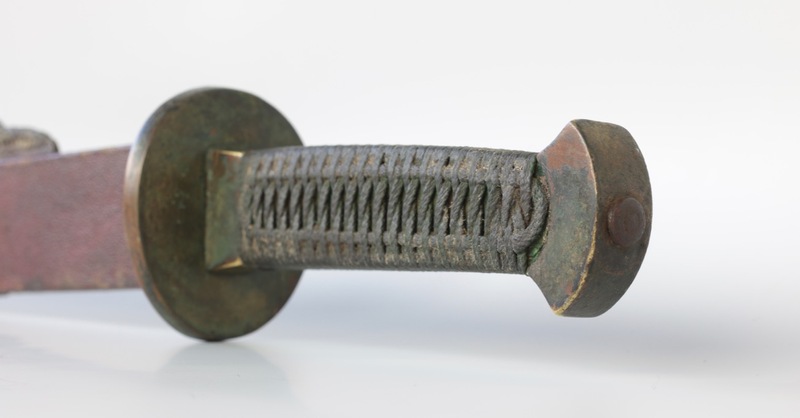 All other fittings are original to the piece, and left in their original heavily patinated condition. Handle and grip wrap are also renewed. 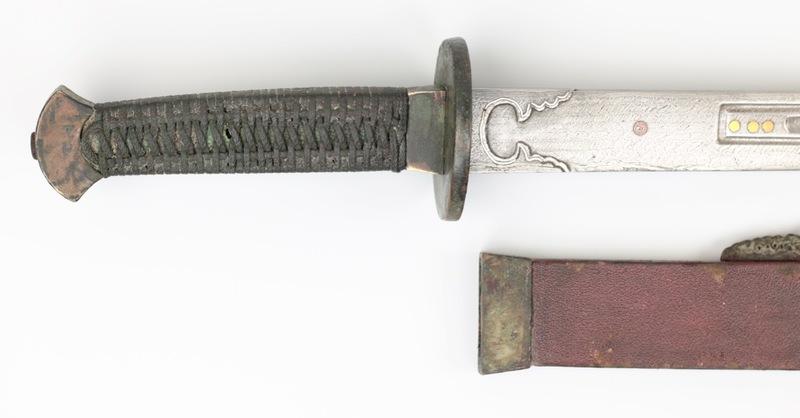 Blade is in excellent condition throughout: It retains its original etch and polish. 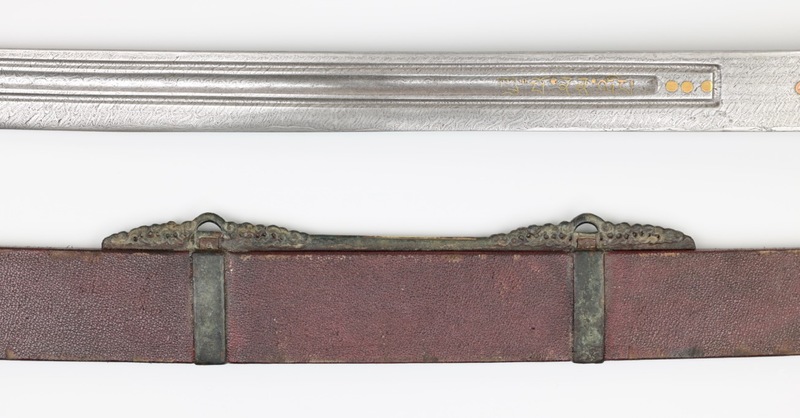 The sword was published in the Metropolitan Museum Journal 36, in Philip Tom’s article: "Some Notable Sabers of the Qing dynasty in the Metropolitan Museum of Art." 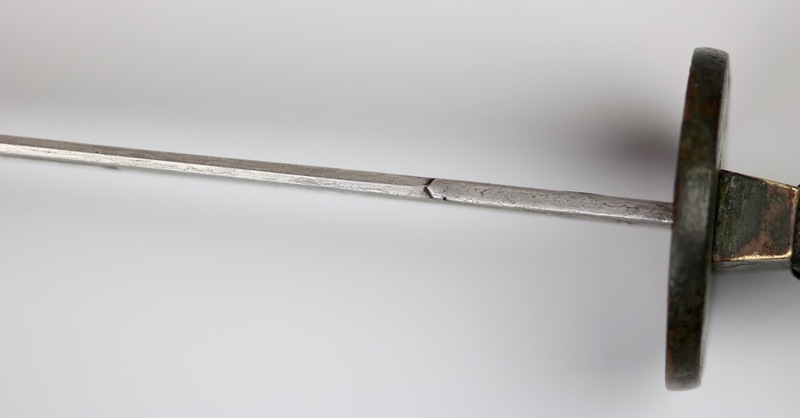 A large and important Chinese saber with complex blade made out of no less than seven twistcore rods, executed with great control. The after-market additions strongly suggest it ended up in a Tibetan religious collection, perhaps in the armory of a Lamasery. 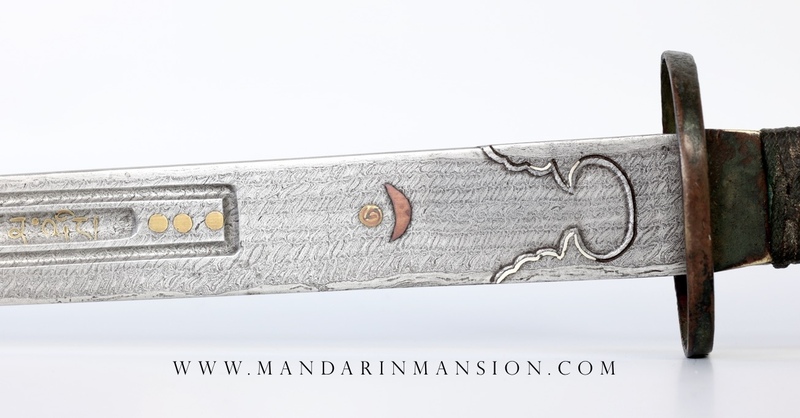 It's a testament to the sword maker's art of the high Qing dynasty, bearing intriguing marks that demand more study. An exceptional piece.